It is a new version of K&F Concept backpack which has been designed to be lighter and easier to carry when you do not have much as much kit to carry. And it’s very suitable for photography lovers do for short trips, also can be used in the daily travel. Twin Back / Shoulder straps are fully adjustable and are padded for user comfort. Side straps to secure tripods or other bulky accessories. This K&F backpack with large main opening offers multiple storage options for your DSLR cameras, lenses, tripod, flashes,13.3″ tablet and other accessories. Durable black 840D 100% Waterproof Nylon and Matel zippers,ample interior storage; Zipper can be equipped with a code lock, anti-theft. High quality buckle and grooved nylon webbing strap, anti-slip. Large capacity with 2 main specially customized honeycomb plate, solid and durable for long-term use, to keep the whole backpack undistorted; The interior of the bag has removable velcro dividers so you can rearrange to fit your camera and accessories. Ventilate and shockproof design, make you feel comfortable. Waterproof zipper design and 840D waterproof nylon material protects against spills and splashes. 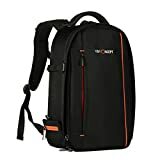 • It is heavily padded adjustable shoulder straps, as well as the wide adjustable waist and chest straps, make the backpack comfortable to ware even when loaded with all your gear. • Inner 8 removable dividers for free combination, 2 main specially customized honeycomb plate, solid and durable for long-term use, to keep the whole backpack undistorted. • The pack also features exterior tripod straps on its side, side buckles for additional storage. This entry was posted in Discount Photography and tagged 840D, Accessories, Backpack, Black, Camera, Canon, Code, Concept, DSLR, Laptops, Large, Lock, Men/Women, Nikon, Nylon, Professional, Size17.3*11*5.5, Sony, Tablets, Waterproof by Ball Photo. Bookmark the permalink.